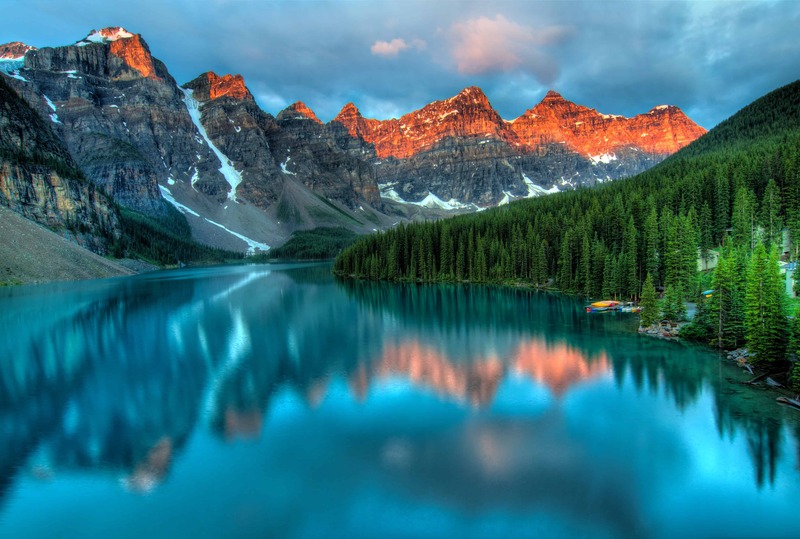 Taken at the peak of color during the morning sunrise at Moraine lake in Banff National park. Before we get started, you should know that we get it. Really, we understand. The struggle is real when it comes to planning a hiking trip, especially for a short period of time. 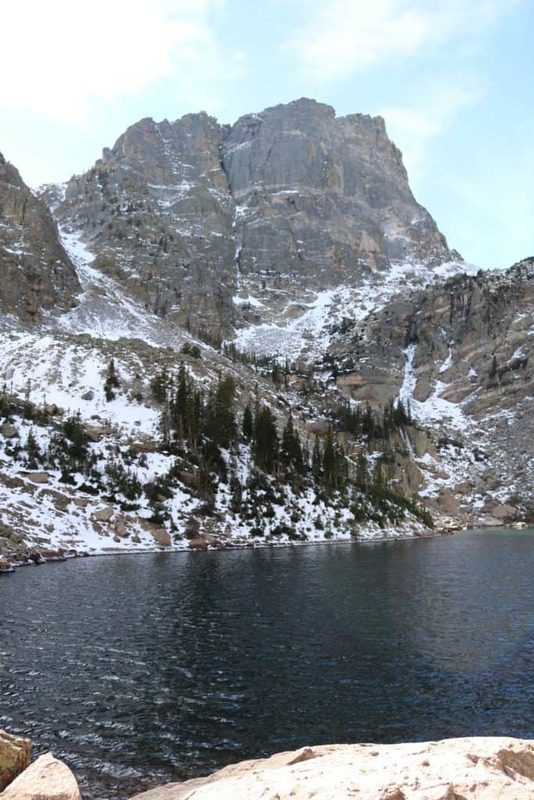 For a 2 day itinerary Rocky Mountain National Park trip, most people purchase a guide book. This guide book is filled with hikes that include elevations, compass details, and data that are difficult to process into actionable information that would allow someone to actually PLAN a hike. Tell me if any of these thoughts have gone through your mind? How long are these hikes? Do they leave from the same trail head? What should I really see? Am I going to get lost? Just a quick note! If you are interested in spending only one day in Rocky Mountain National Park because of a shorter time frame, we’ve got you covered. 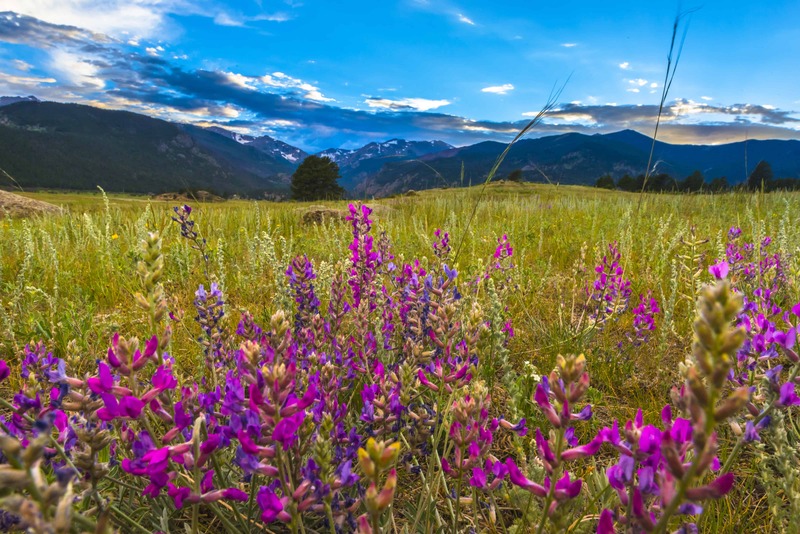 The work has already been done for you, you just need to head over to our 1 day itinerary of Rocky Mountain National Park! Start off at Donut Haus, a favorite stop in Estes Park. Grab your donut early, because when they sell out, they are SOLD OUT! Here’s a secret! You can call ahead 970-586-2988 to place an order so it’s there waiting for you! Seriously? Delicious. Don’t believe me? Check out the donut menu. And I’m not even an affiliate, people, I just love their donuts! Need another place to start off on Day 2? Try Kind Coffee in Estes Park. Mmmmm, coffee. If you only have one day in for an itinerary in Rocky Mountain National Park, you NEED to see these sites. Don’t worry, you’ll see it all! You need to START EARLY. Repeat. Start early. Whatever time you think you need to start, just set your alarm for an hour (or three) before that. Seriously. Make sure that you have a National Park Pass, or at least have purchased a pass into Rocky Mountain National Park. You can purchase one at the gate. Interested in going more than one day, or maybe another time during the year? Learn about the National Park Pass and how that might be the best decision for you! Many people hike Rocky Mountain National Park near Estes Park. It can get very busy in this popular national park! You may choose to ride the shuttle bus service available at Rocky Mountain National Park during the operating months May through October. Please check the National Park Service Website Here in order to see dates, times, and a map of the shuttle bus service within RMNP! We won’t be sending you on any crazy expeditions. But that said, it’s always best to practice safety. (This includes learning about wildlife safety.) The trail conditions for this amazing itinerary can be found here. Updated Trail Conditions can be found by clicking here. Rocky Mountain National Park weather can be fickle, and its always important to look at the road conditions. Road Conditions in Colorado can be found by clicking here. You will be gone likely most of the day. Make sure to pack everything you (and your family needs.) This includes extra (extra, extra) water, food, and necessities. We have compiled a list of the most important items you need to carry with you for a long day hike already! Feel free to add to it as you see fit! Now, let’s get started! Overview – Four Lakes and a Waterfall! 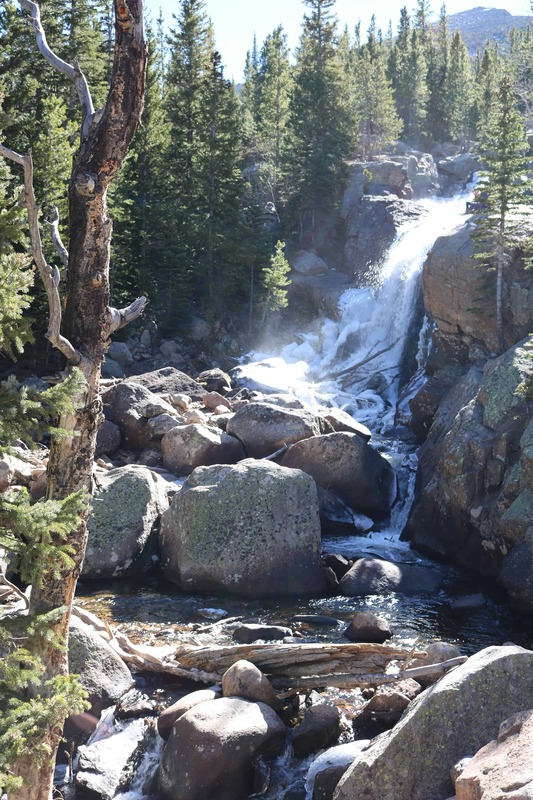 Today you will be visiting FOUR incredible and iconic lakes in the Estes Park area and a waterfall! 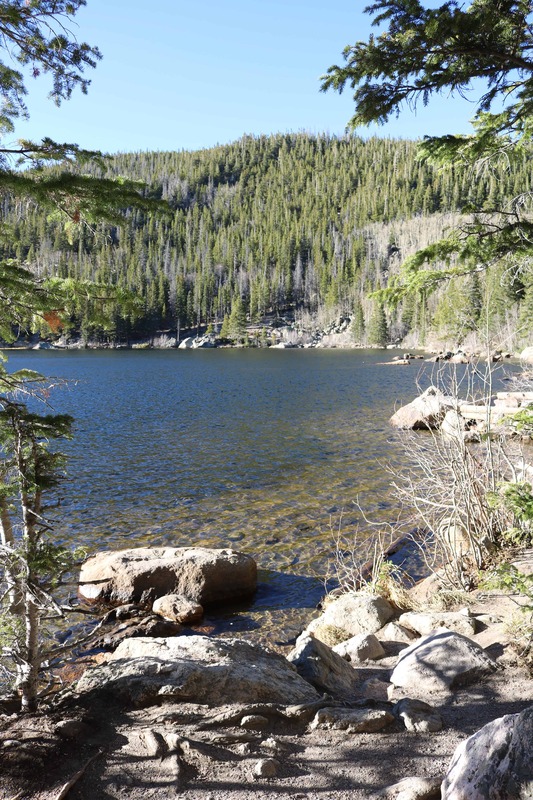 Travel to the Bear Lake Trailhead (Travel 8 miles on Bear Lake Road from US 36). Park in the Bear Lake Trailhead parking lot. Please note: The 3D maps in this post, and below are NOT FACING NORTH (on purpose!). These maps are shown specifically for those of us who are “map-ically challenged” and need to visually see which way we are hiking. Please refer to the compass at the bottom right of the map below to show where NORTH actually is! When you click on this, and open the map, you can then click on the link below the blue box on the left and have these directions sent DIRECTLY TO YOUR PHONE! You can then screenshot those images, so that you can see these directions, and maps, even if you do not have wi-fi as you are hiking! You really should be able to only hike one way for the Bear Lake Trail Loop Hike, and the signs are clearly marked. When you get to the actual Bear Lake Hike trail head, you will see the huge sign for the Bear Lake Hike to your right. Take it! Walk around in a loop around the Lake and take lots of pics to make family and friends jealous! When you get back to the start of the Bear Lake Trailhead, you will want to look for some signs. They are clearly marked, and to your right as you come out of the Bear Lake Loop. Walk all the way to Nymph Lake! 1.0 mile from Bear Lake Trailhead you will see that the trail branches off to Lake Haiyaha. Don’t take it! Total time now: 1 hour, 30 minutes to 2 hours 30 minutes depending on how long you spend taking pictures, sightseeing, etc. Walk another 0.7 miles to Emerald Lake on the same trail! Celebrate! Total time now: 2 hours to 3 hours depending on how long you spend taking pictures, sightseeing, etc. Now you have to turn around and walk back the way you came! Walk all the way back to Bear Lake Trailhead. Total time now: 3 and a half to 4 and a half hours depending on how long you spend taking pictures, sightseeing, etc. 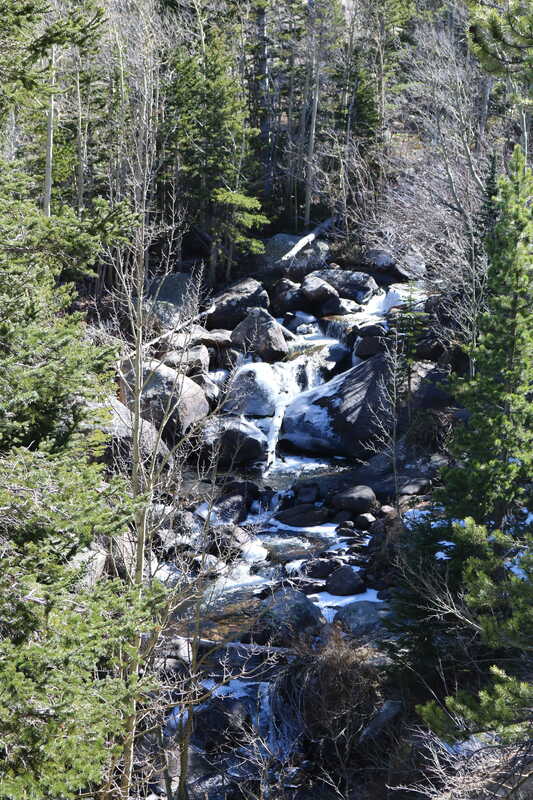 Remember how I said there was a waterfall in this Itinerary for your one day Rocky Mountain National Park Trip? I didn’t lie – here it is! You have been walking this entire time on the Dream-Emerald Lakes Trail. Just before you get back to the Bear Lake Trailhead, this trail will end. When it ends, go to the RIGHT. This will be southeast. You will walk along this all the way straight until you get to Alberta Falls! Enjoy the Waterfall and then come back! Total distance from the fork in the road above: 1.8 miles round trip. Total time to get to the waterfall and then back to Bear Lake Trailhead 1 to 1.5 hours depending on how leisurely you are walking! Total time now for four lakes a waterfall: Approximately 5 to 6 hours. You could do this in less if you really hustled, but isn’t the point to enjoy the scenery and the day? You will have walked approximately 8 miles today, in about 5 or 6 hours. I would give yourself another hour or two. You could stop and eat lunch and enjoy the view, because these views are incredible! Overview – Two Lakes (maybe three!) and a Waterfall! Today you will be visiting Two lakes (maybe three if you do the “extra credit”) and one waterfall! Drive 0.5 miles and then turn left JUST BEFORE REACHING the campground. You will drive on this for a little over a mile and the pavement will end after 1.2 miles. Drive another 2 miles and the road ends. This is SERIOUSLY a dirt road, people – look above! Please note: The 3D map below is NOT FACING NORTH (on purpose!). These maps are shown specifically for those of us who are “map-ically challenged” and need to visually see which way we are hiking. Please refer to the compass at the bottom right of the map below to show where NORTH actually is! The first stop is the Pool. This will be on your right hand side about 1.7 miles on the Fern Lake Trailhead. 1.7 Arrive at the Rock and Timber bridge over the Big Thompson River at The Pool. You made it! 2.7 Keep walking another mile and you will be at Fern Falls! 7.8 Turn around, come back the way you came and you will end up back at Fern Lake Trailhead. The total time on this trip is about 4 hours, and you will have walked almost 8 miles. I honestly think that this is totally enough for one day. However, if you are so inclined, I’ll give you one extra that you can do that links to this trail! Look at this map CLOSELY. Very Closely. It’s super important. INSTEAD of walking all the way back to the Fern Lake Trailhead, as you are walking back, at the POOL, you will see a sign for Cub Lake Trail to the RIGHT. If you want to do this extra bit, that will be about 4.1 miles and add another two to two and a half hours to your trip. If you take this route, just stay on the Cub Lake Trail, until you reach the Cub Lake Trailhead, and then you can cross the dirt parking lot to get to the Fern Lake Trailhead! If you do this “extra credit” option, your total miles for the day will be approximately 12 miles. I would guesstimate that it would take, on average, 6 hours or more to do this, given stopping times for food, etc. Thats a LOT for one day, but again it’s really dependent on your ability, and how many people are with you, and how fast you are. I’ll leave this up to you, but wanted to include this option for you in case you really wanted to see THREE lakes! Two Lakes (maybe three!) and Waterfall! You will have walked approximately 8 to 12 miles today, in about 4-6 hours. I would give yourself another hour or two. You could stop and eat lunch and enjoy the view, because these views are incredible! Interesting in a doing something fun in the evenings in Estes Park? Here are some ideas! While Stephen King’s visit to The Stanley inspired The Shining, the movie based on the novel wasn’t filmed at the Estes Park hotel. Apparently, Stephen King and his wife stayed the night in room 217 (room 237 in the film), and this inspired him to think of the Overlook Hotel, and ultimately created the ominous setting of his best-selling novel, The Shining. However, while the Shining wasn’t filmed at the Stanley, the Shining mini-series was filmed here, as well as……”Dumb and Dumber!” The restaurant is good, and it’s a really fun setting to just go and get one of their (very strong!) drinks! Estes Park has an adorable street where a ton of shops, restaurants and drinks can be found. Breweries are a plenty here as well! Check out Estes Park Brewery, Rock Cut Brewing Company, Lumpy Ridge Brewing Company, or the Tavern 1929! There is one taffy shop that is the best. There, I said it. You can just go ahead and pass by all of the others, because this one is amazing. The Taffy Shop was established in 1935, 83 years ago, so they know what they are doing! You can even have taffy shipped back home to friends and family. It’s so good, you don’t want to miss this. We hope you had an amazing 2 days in Rocky Mountain National Park! You will have seen up to 7 Lakes and 2 waterfalls and some gorgeous views, and have memories for a lifetime! Let us know your thoughts, and please share your memories, pictures, and how this itinerary helped you!